If it wasn't for bad luck, some people wouldn't have any at all. There are people out there who are so unlucky, they are lucky. Today's Oddities post features 2. The first is what many consider to be the luckiest woman in the world. Her name is Vesna Vulovic. In 1950, Vulovic worked as a stewardess for JAT Airways in the Balkans. On January 26, while flying over Czechoslovakia, a bomb went off in the forward baggage compartment. At the time of the explosion, the plane was cruising at 33,000 feet. The explosion ripped the plane in half. A plane suffering that type of damage no longer flies. I fell rapidly to the ground killing everyone on board. On this day, Vulovic wasn't even supposed to be working. But, Vulovic seems to have used all of her bad luck up before the plane hit the ground. Well, almost all of it. One of the first people to reach the crash site found Vulovic alive, and fortunately for her, was a former medic in the German army. He was able to treat the worst of her injuries at the site, keeping her alive until she could be transported to the hospital. She was in a coma for 27 days. Here injuries were severe. She suffered a fractured skull, several fractured vertebrate, and two broken legs. She had been found in the mid-section of the plane, half in and half out of the wreckage. She was pinned to the floor by the body of one of her coworkers, and a drink cart. Today, she is still the world record holder for surviving the longest fall without a parachute. The second person I want to tell you about was even unluckier that Vulovic. His name was Tsutomu Yamaguchi. During World War Two, Yamaguchi worked for Mitsubishi Heavy Industries. On August 6, 1945, Yamaguchi was wrapping up a three month long business trip to Hiroshima, and was on his way with his co-workers to the train station when he realized he had forgotten his travel stamp. So, he rushed back to where he had been staying to get it. At 8:15 in the morning, he was walking back to towards the station when the Enola Gay dropped her payload. Yamaguchi was just over a mile away from the blast, and was severely burned in the blast, but he survived. After resting for a bit, he went out in search of his coworkers, and was able to find them around nightfall. They slept in an air raid shelter, and were able to make their way home the next day, August 7th. When he got home, Yamaguchi knew he had to get treatment for his burns. He went to the hospital where they patched him up as best they could, and then sent him home to recover. Yamaguchi wasn't one to just sit idly by, though. Especially when there was a war on and Japan needed every hand to aid the war effort. So, on the morning of August 9th, Yamaguchi braved the pain and went to work and Mitsubishi Heavy Industries. He was telling his coworkers about the bombing and the aftermath, and how fortunate he was to have made it back to his hime in Nagasaki alive. While he was telling his story, the bomber Bockscar dropped it's payload. It exploded, again, just over a mile away from him. All of his bad luck must have been used up, though. Yamaguchi wasn't injured in the second blast. While approximately 160 people were known to be directly affected by both atomic blasts, Tsutomu Yamaguchi is the only one officially recognized by the Japanese government for the fact. 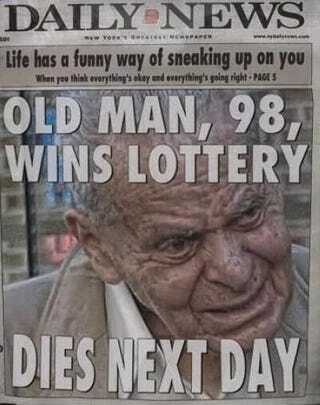 His good luck lasted until he died from stomach cancer in 2010 at the age of 93. So, remember this the next time you think your luck can't get any worse. It can, but it will get better, if you can stay alive long enough.